It has been a while since we covered the AirCurve iPhone dock from Griffin Technologies, and I just had a chance to try out the company’s update for the iPhone 4, the AirCurve Play. The AirCurve Play works like the Horn Stand. It is a device designed to increase the volume of the iPhone 4, but without any electronics that are found within most iPod/iPhone speaker docks. The AirCurve Play states that it can increase the external volume by about 10 decibels. At first I wondered if that was going to make a difference, because the Horn Stand says it increases sound by 13 db. I barely heard the difference in that device. In this AirCurve Play, I heard a significant difference, and I don’t even own an iPhone 4. My second generation iPod Touch didn’t fit in the place made for the iPhone 4, but fortunately, there was a rubber cradle thing that could be removed in order to accommodate more thicker iDevices than the iPhone 4. 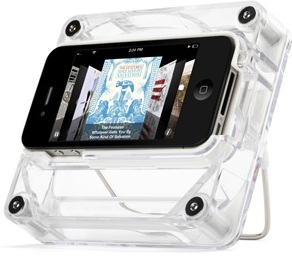 In addition to having a place for an amplified iDevice, the AirCurve Play serves as a stand. This is good for watching movies, listening to music, and making video calls using FaceTime. You should be able to get the AirCurve Play on the Griffin Technology website for about $19.99.